Please note that there will always be variations amongst babies in regards to age, weight & length, for example a very large newborn. The following is a general guideline for babies within the 50 (average) percentile, that should help you select the correct size for your baby (please see safety information below). While it may seem better value to buy something your baby will 'grow into', you risk buying something that is not safe. Your baby may slip down inside the neck, with a sleeping bag that is too big. The medium model can be worn once a baby reaches about 22 lbs*. The large model is for toddlers that are at least 28 lbs*. *There is a certain amount of overlap that is inherent in the sizing. The goal of a good fit in a baby sleeping bag lies more in the chest and neckline and less in the length (all the sleep sacks are long in length and should have plenty of room for the baby to "grow into."). If you would like more information or assistance regarding sizing do not hesitate to email us. Choose a sleeping bag that’s suitable for the season - for example, a low tog one for summer (0.5 or 1 tog) and no more than a 2.5 tog for winter. If you buy anything higher than this, it could make your baby too hot. 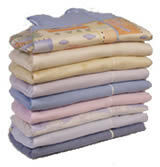 If your baby is sweating or her tummy feels hot to the touch, remove some of the bedding. Don't worry if her hands or feet feel cool, this is normal.